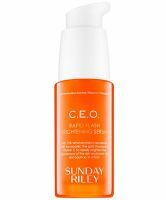 This serum really delivers results — my skin looked noticeably brighter almost immediately. I also enjoyed the cheery packaging and orange-y scent. I would give it 10 stars, but it's a bit pricey. Not only does this smell delicious (like oranges) but the creamy consistency offers nice hydration and brightens over time.